Most of us—men and women alike—have what we consider to be less than perfect skin, and as we age, those imperfections increase. We may have uneven skin tone or poor texture or discoloration. We may have enlarged pores and sun damage. The older we get, the more signs of aging present on our skin, including lines, wrinkles, and spots. There are as many skin products to target these issues as there are grains of sand on the shore. Some products yield reasonable results while others are ineffective and a waste of money. Nevertheless, men and women will always look for that perfect product or treatment to restore smoothness and freshness to skin and minimize the signs of aging. The Halo hybrid fractional laser is a relatively new skin treatment that has rapidly gained proponents across industries. 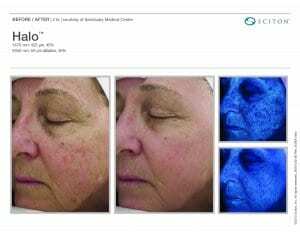 The attraction of this treatment is its effectiveness in removing or reducing blemishes, damage, and issues that compromise the appearance of the skin. Halo treatment is also attractive because of the relatively short Halo laser recovery time. A medical procedure performed in a doctor’s office, the treatment employs Halo hybrid laser units that utilize a fractional laser. This laser targets both the epidermis and the dermis—the top layer and the bottom layer of the skin—at the same time, resulting in an effective treatment with minimal recovery time. In other words, patients can be back at work within days of the procedure. To get a little more technical, the laser delivers ablative and non-ablative wavelengths simultaneously. The ablative (fractional) wavelengths applied to the skin open tiny pathways in the skin—similar to the way an aerator opens up spaces in a lawn. The non-ablative (non-fractional) wavelengths drill tiny holes in the skin; the skin views these holes as injuries and responds by producing collagen and elastin (the substances that fend off wrinkles, plump up skin and make it flexible). By targeting the top and bottom layers of the skin and applying both ablative and non-ablative wavelengths, the Halo hybrid laser is more effective than other less technologically-advanced laser procedures. 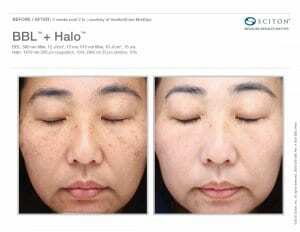 Halo laser resurfacing yields results on 25-30 percent of the skin, as opposed to other skin-repair systems using laser technology that only resurface 5 percent. Ablative wavelengths—those that produce the pathways—can yield dramatic differences with wrinkles and furrows. Less pronounced signs of aging, such as age spots or uneven skin tone, are addressed by non-ablative wavelengths and the spurred production of collagen and elastin. Signs of sun damage are removed or reversed—sun spots, uneven skin tones, fine lines and wrinkles, and hyperpigmentation (where patches of skin become darker than the surrounding skin, a condition produced by melanin deposits). Scarring caused by acne, chickenpox, etc, responds extremely well to Halo treatments and can be significantly reduced and skin left smooth and soft. Even a Halo face lift of sorts is possible in that the Halo facial laser greatly reduces blemishes, wrinkles, sun damage, and scarring, leaving the skin looking brighter, firmer and younger. 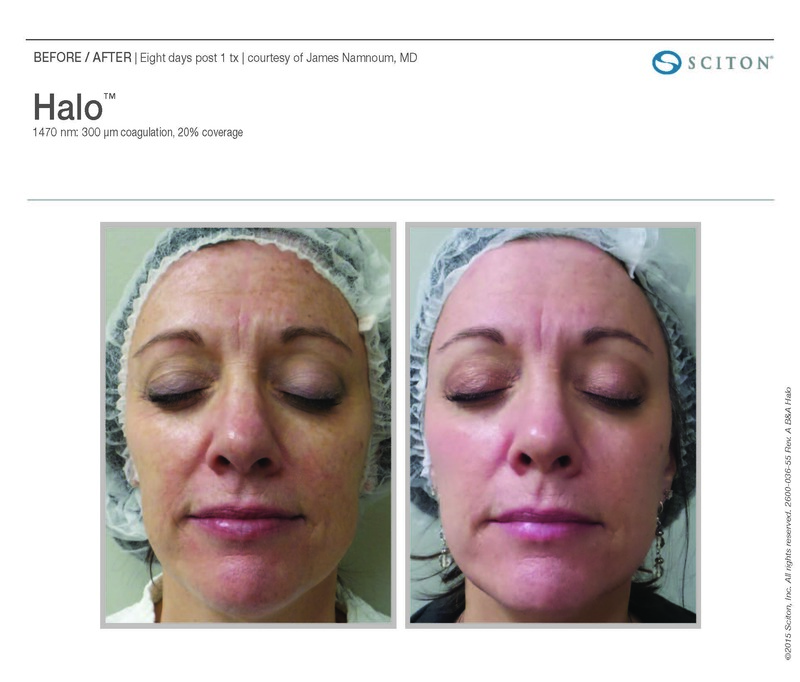 Some companies providing Halo treatments call their product a Rejuvenation Lift. 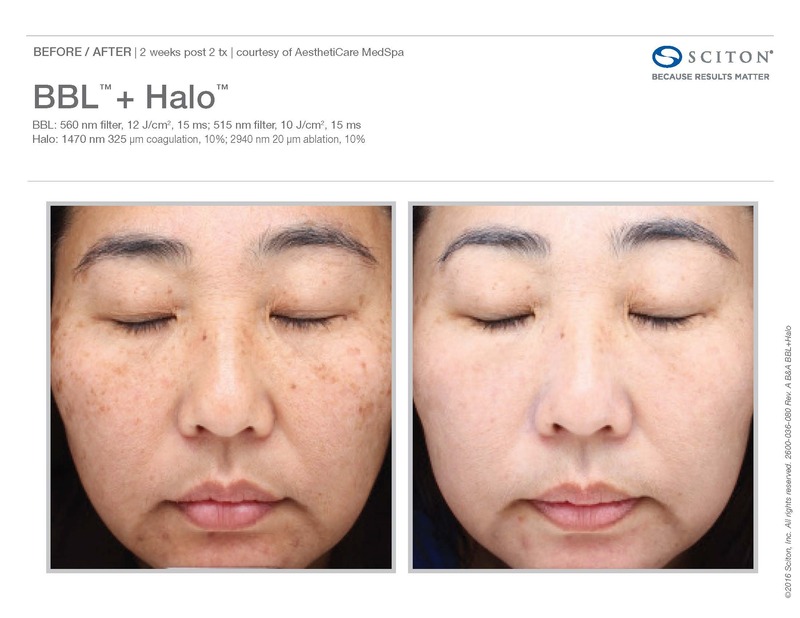 Halo treatments are also finding appeal with celebrities and men and women in their 20s and 30s. This demographic incorporates Halo laser treatments into their wellness regimens as an aging prevention measure. Some celebrities will work in the laser treatments between their shoots or gigs. What does the Halo facial procedure involve? Patients sit in a chair not unlike a dentist’s chair for the duration of the procedure. A clinical nurse practitioner applies numbing cream (a topical anesthetic) to the face to reduce sensation and make the treatment less painful. The treatment typically is somewhat painful, as the laser zaps the skin with heat over and over. The skin usually reddens and feels hot as the laser unit moves over it. Motion tracking technology ensures that the whole area is covered evenly. The treatment only takes about 20 minutes, but the pain and heat sensation can last another half hour. Patients are usually given a wand that dispenses cold air and cold compresses to alleviate the discomfort. Sometimes steroids are prescribed to reduce possible inflammation later. The evening after the procedure can be uncomfortable, with skin swelling and pain. Within a couple of days, pain, swelling, and redness have subsided and often the skin will feel itchy—a sign of healing. Many patients are comfortable going out in public by this time. The skin is exfoliating now, so dead skin cells begin sloughing off. Some doctors recommend vinegar soaks to encourage the loosening and sloughing of the skin cells. After dabbing cotton balls or soft cloths soaked in vinegar on the skin and removing as much dead matter as possible, patients usually apply a gentle cleansing product and a healing moisturizer. Some doctors have formulated their own moisturizers specifically to help patients with post-laser wounded skin. Within four days of the treatment, most patients have no more inflammation. The skin is peeling or flaking somewhat, and it’s appropriate to continue gentle cleansing followed by moisturizing. Patients that go out into the sun should protect their faces with a chemical-free sunscreen. A number of sunscreens are available that are formulated for recovering skin. Five days after treatment, most patients are back to normal, with clear, even-toned skin, smaller pores, reduced wrinkles and lines, and smoothness where there used to be scarring. Halo hybrid fractional laser cost varies, of course, depending on the extent and nature of the skin concerns that are to be addressed. It is not an inexpensive procedure and can cost $1400 to $2000 for one treatment. Sometimes cost is reduced if multiple treatments are purchased. Typically, a person gets the best results with two Halo treatments done in the first year. This brightens and rejuvenates skin and prevents signs of aging. The decision regarding number of treatments should be made in consultation with a clinician. It’s possible to undergo one or two aggressive treatments or to instead have multiple, less-aggressive treatments spread out over a period of time. The end results are the same. How do Halo treatments compare with other laser treatments? 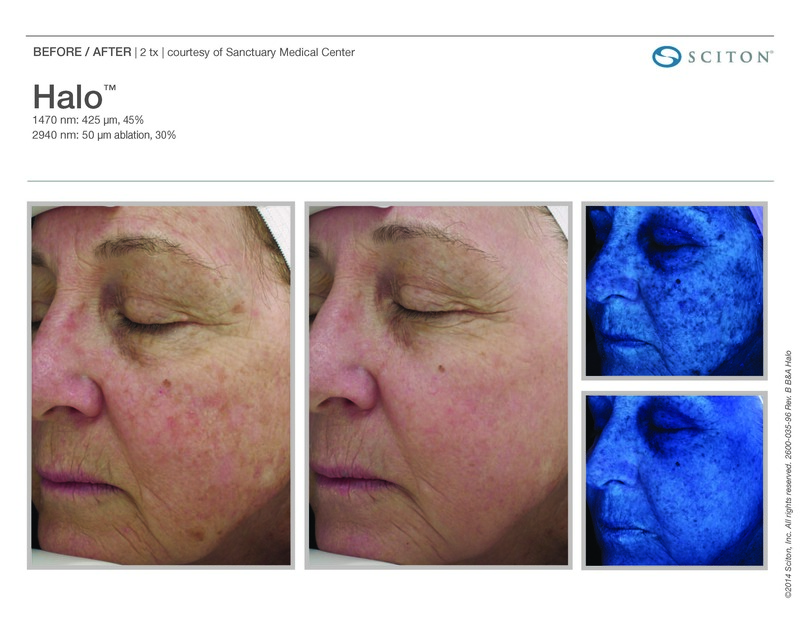 Older laser technologies such as CO2 and Fraxel usually require a longer healing period and recovery time than Halo treatments. Additionally, the appearance of the skin after treatments with other laser systems is redder and sometimes bloody. In general, Halo treatments are gentler on the skin and therefore recovery time is faster. What do patients say afterward? According to Sciton, the manufacturer of the Halo laser technology, 88% of the patients who undergo the procedure say that it’s worth it. Pores and texture is improved however wrinkles are still there. I’ll talk with doctor for a more aggressive level when I have my face done [again]. Love my fresh new skin! For those that think CO2 is the gold standard, I’m thinking CO2 is the silver standard and Halo is the Gold standard. Skin feels healthy and fresh. Felt comfortable going to work without wearing any face makeup to cover up dark spots. Love the results. I look so refreshed. One aggressive procedure is so much better. Pores under the eyes are almost gone. Complete elimination of my acne scarring around my chin. I’m so happy with the results, I’ll do the rest of my face!